The sound of chanting got closer and closer as we rounded the corner in Fort Cochin. We had arrived at the famous Chinese fishing nets on the water of this ancient port town. Fisherman stand in small groups on each of the wooden piers, as it takes a team to raise these nets. Little did we know that I would soon be part of one of those teams. More on that in a bit. Working on a sort of pulley system, the nets are installed at the shore and operated by sinking them into the water for three minutes at a time and then pulling them out of the water again, catching fish in the process. 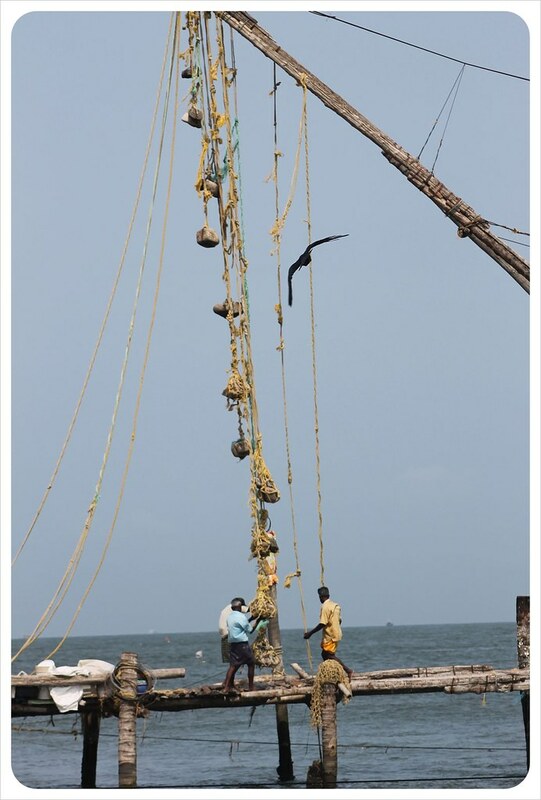 Big, heavy stones hanging from ropes serve as counterweights at the other end of the nets. The huge constructions are around 10 meters high and hold nets 20 meters across. 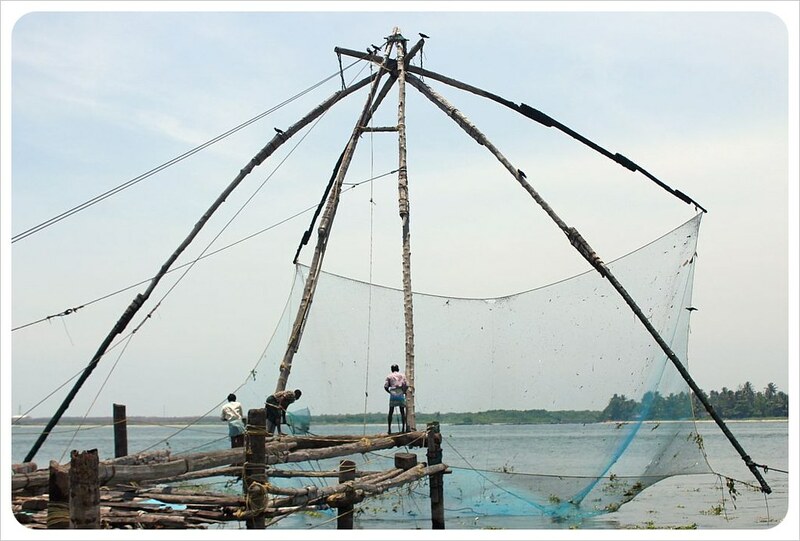 The nets are held by a cantilever that reaches all the water out over the water, and this cantilever is lifted up by a team of five to six fishermen by hand. 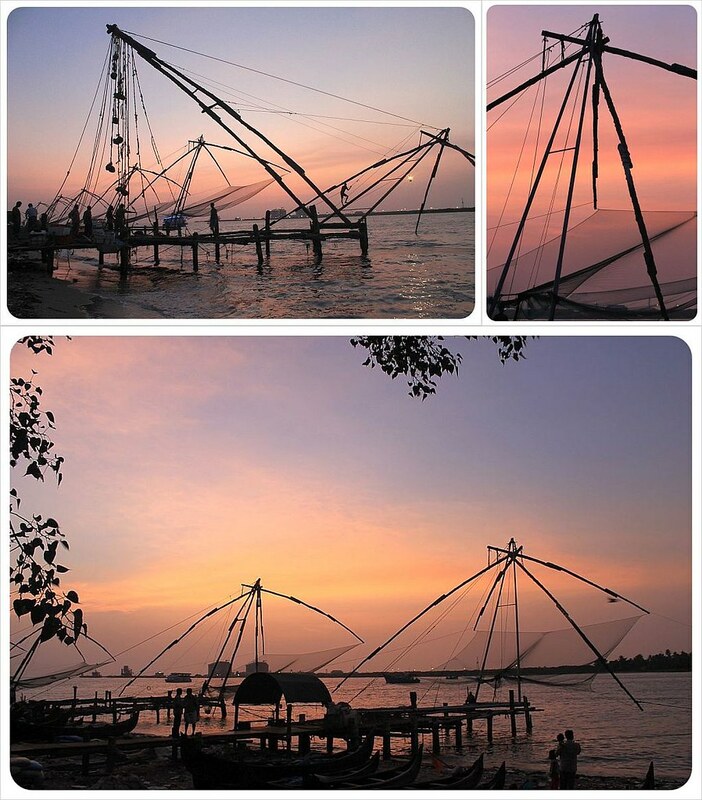 The Chinese fishing nets in Fort Cochin were actually some of the most interesting structures we have seen during our travels. When they were first built in the 14th century, they were entirely made of wood, but some parts on some nets have been replaced by metal. The total weight of what is pulled up and down weighs one ton. 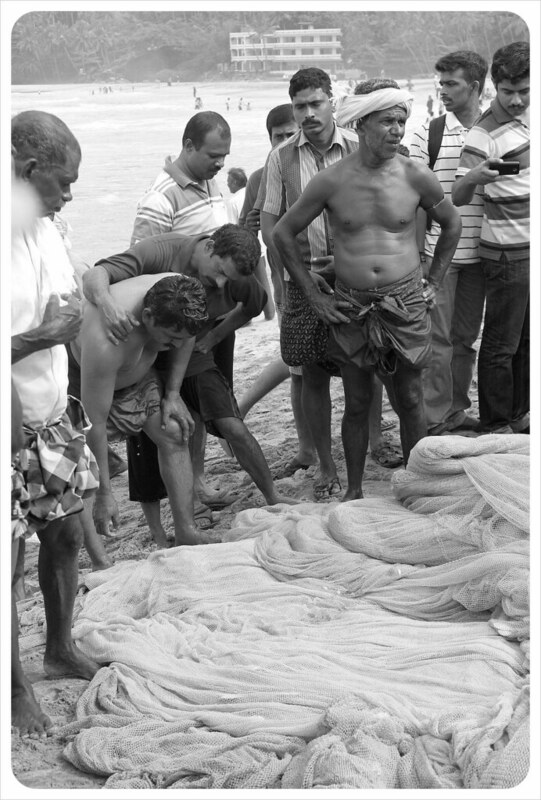 Because of the intense weight, the fishermen need to be 100 per cent focused every time they pull down the robes. Even between five or six of them, the weight is still around two hundred kilos per person. 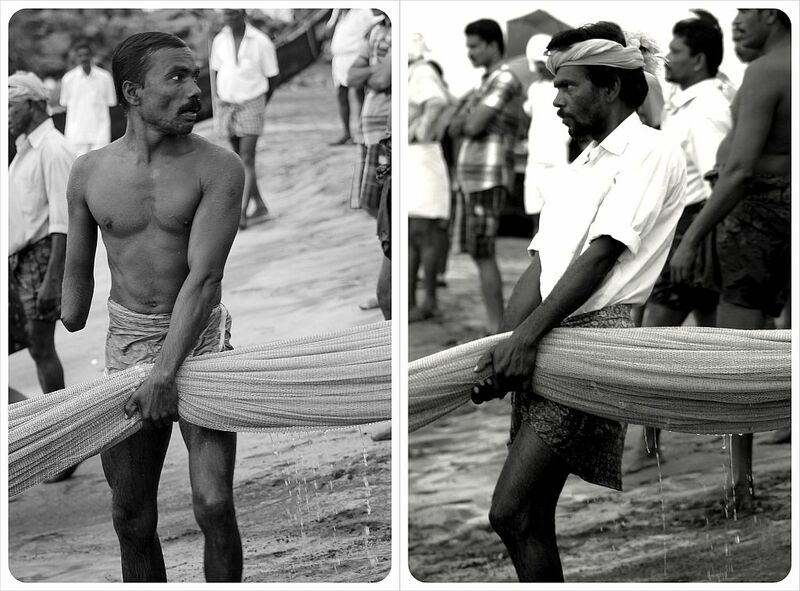 In total, these fishermen pull down the robes to lift the nets about three hundred times a day. Three hundred times a day! Once the net is lifted, one of the fishermen walks to the front of the structure and leans far into the net, fishing out what’s in there with a smaller net, and brings it back to the end, where the catch is put into boxes. Watching the fishermen for a while we were shocked to see how little they were actually fishing out of the water – there were barely any fish in the nets, and if there were any, most of the time they were tiny! 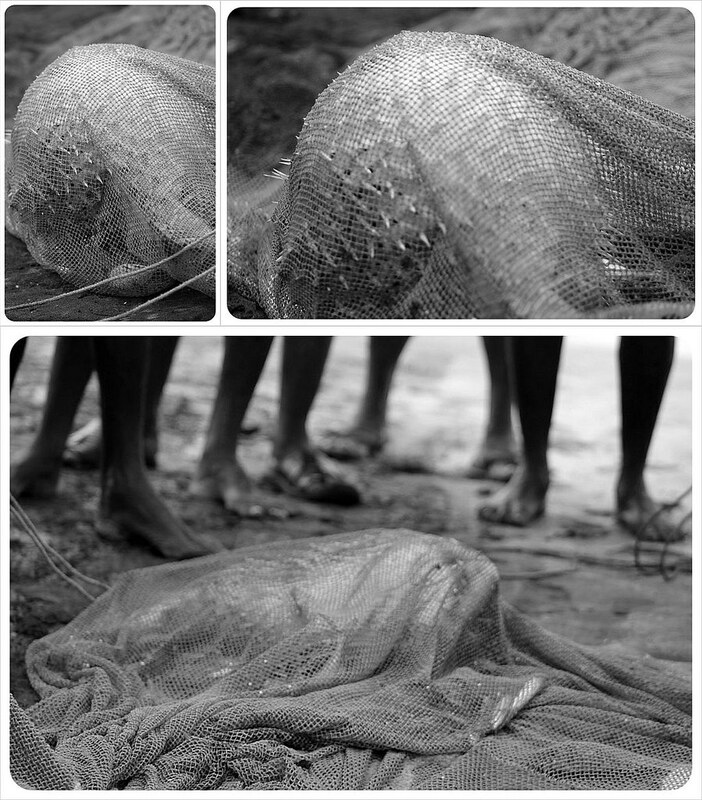 The fishermen of each net form a cooperative that shares the money they make every day. The fish is sold on the fish market right behind the nets, and several restaurants even offer to cook any of the fresh catch that you might want to buy. The fishermen are all very welcoming and don’t mind it if you stand by their net for a while and watch them. 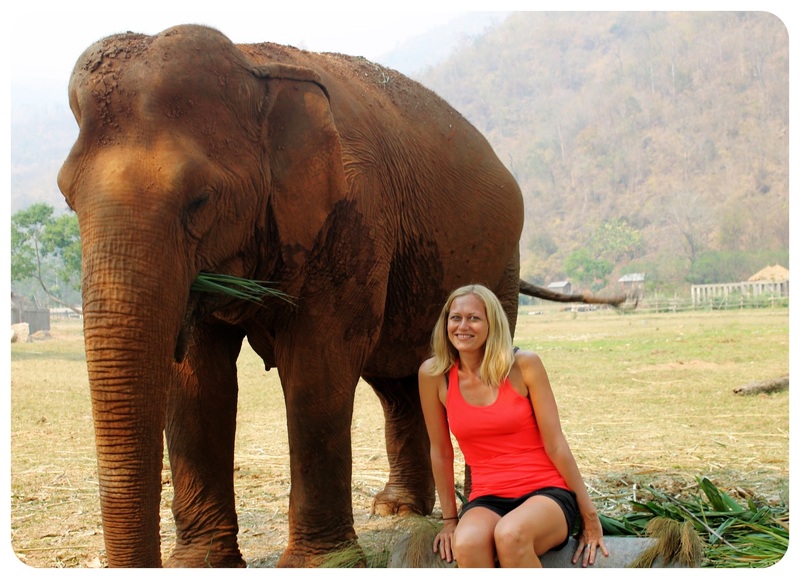 Some even invite tourists to join them and help pulling the ropes down – for a little tip of course. So I tried my luck, and realized how heavy these ropes are. It is unbelievable that the fishermen do this hundreds of times every day for so little fish. Understandably they are thankful for any tourist tips, which seem to have become a second little income for them. How did these Chinese fishing nets end up in South India, you ask? It was actually the Portuguese who introduced them to India when they settled the country, having settled Macau earlier. 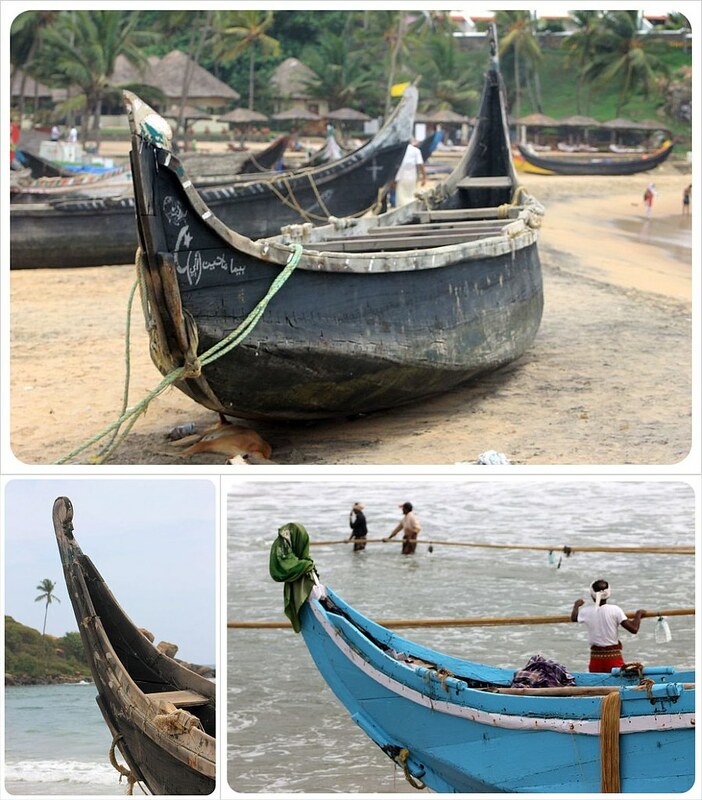 A few days later, we made our way further south in Kerala, and we stopped in a little beach town called Kovalam. It being off season, there were barely any tourists around, but just like in Cochin, there were lots of fishermen – here, they were using an entirely different fishing technique. 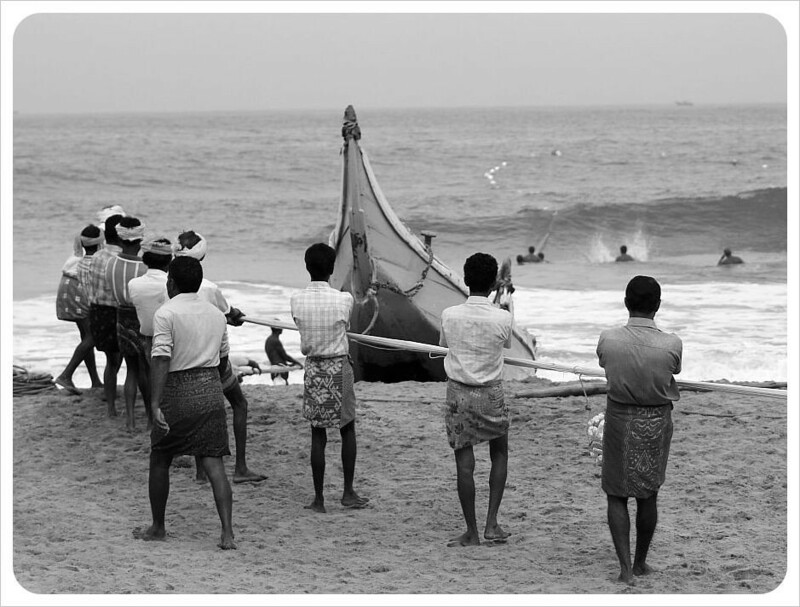 Every morning the fishermen would assemble in their traditional Keralan lungis – kind of a sarong that is worn by the men here – and pull the fishing nets that had been in the ocean overnight, out of the water. A few hours earlier, just about as the sun rises, some of the fishermen would head out in a couple of the simple wooden boats that are lined up on the beach, put the net in the water a few hundred meters off the shore. 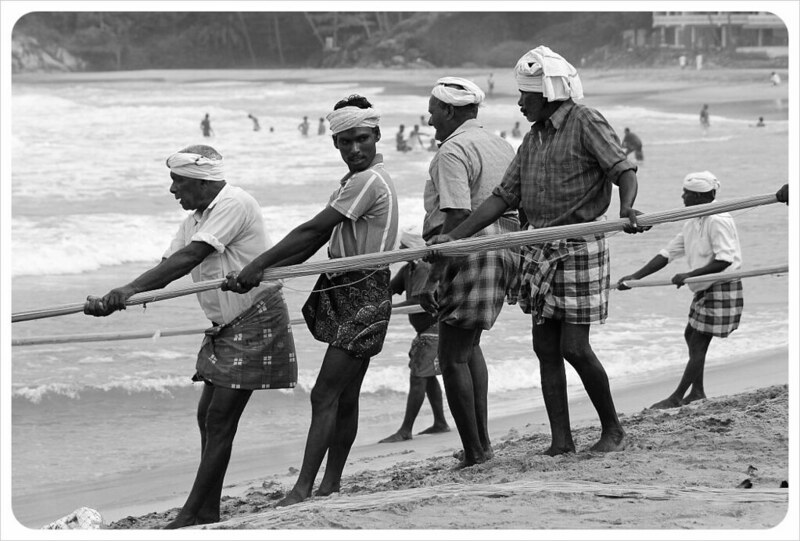 They then float the net and head back to the beach, each boat hauling a long rope from each end of the net. These huge nets are so big and heavy that it takes about 30 fishermen to get them on the shore in a joint effort! 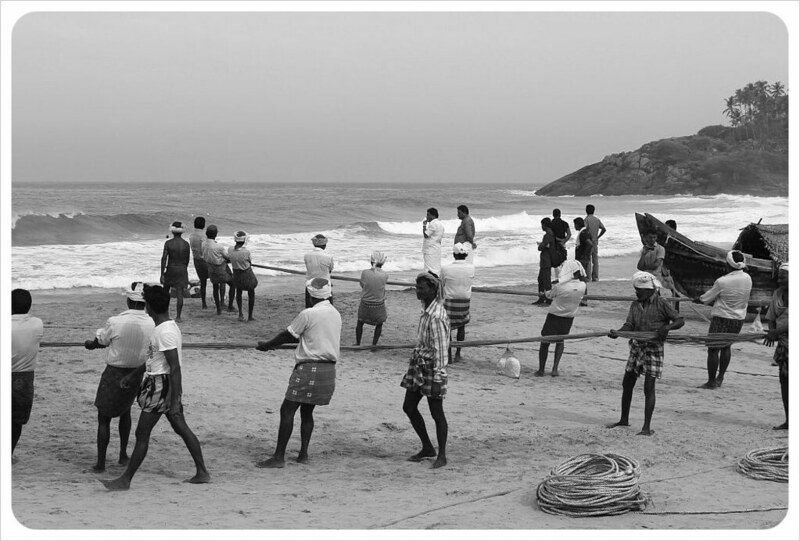 The fishermen form two groups, one for each end of the net. 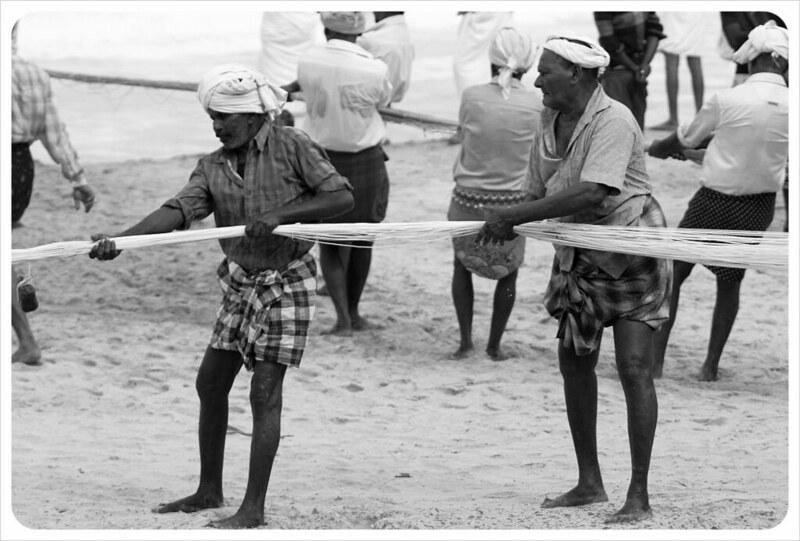 With a similar rhythmic chanting that we heard from the fishermen in Cochin, the men start their sing-song and pull the nets in, moving closer to each other the nearer the net comes to the shore, so that the net forms a circle. Some of the men are back on the beach, but others are all the way out in the ocean, fighting the waves. The current is strong, and wave after wave rolls over the fishermen. The closer the net comes to the beach, the louder the fishermen chant. Toward the end they are pulling the heaviest part of the net, holding all the fish. It takes about thirty minutes until the nets are back on the shore. 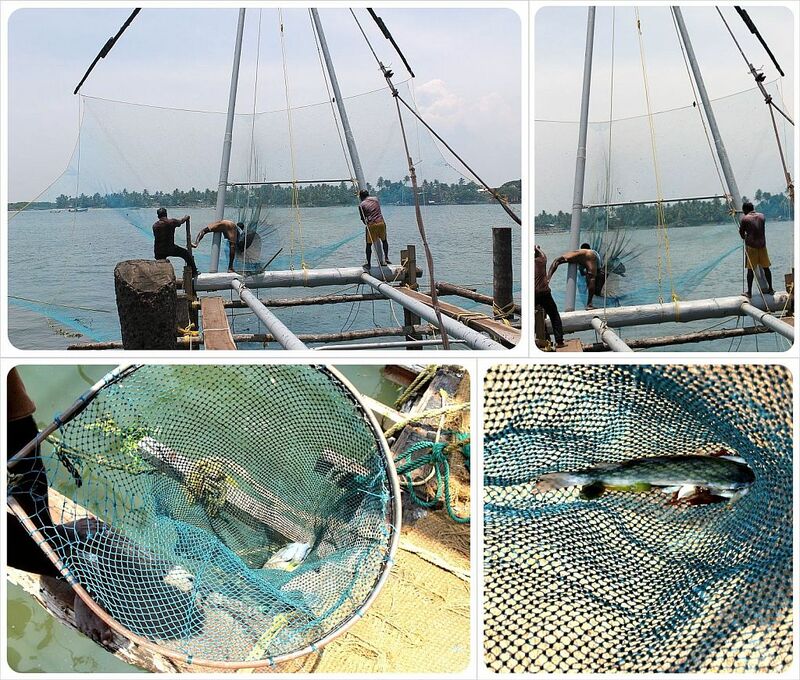 Curious, we move closer to see the catch – and are surprised once again to see that there is almost nothing in the nets! So much work for such little return. The biggest fish is a big blowfish that collapses back on itself after a while. The rest are tiny little fish. A few shrugs, some disappointed looks, and the fishermen go home, knowing they will be back the next morning repeating this very same ritual. WOW…all of that work for such little reward. Incredible! What a post!!! Thanks, Andi. It was mind-blowing to see how hard these men worked for such little return. I wonder how much money they make every day but it can’t be more than $10, if it’s that much at all! I live such a pampered, easy life…. and still find things to complain about. Steph- I could’ve said that! That’s pretty much exactly what I was thinking while I was watching these men. Being a fisherman is definitely one of the hardest jobs. It is very unfortunate that climate change and overfishing is making it almost impossible for those men to earn a decent living. Beatiful pics as ever! I loved this post . It took me back to when I was standing on the beach and watching these guys work so hard for such a small return. 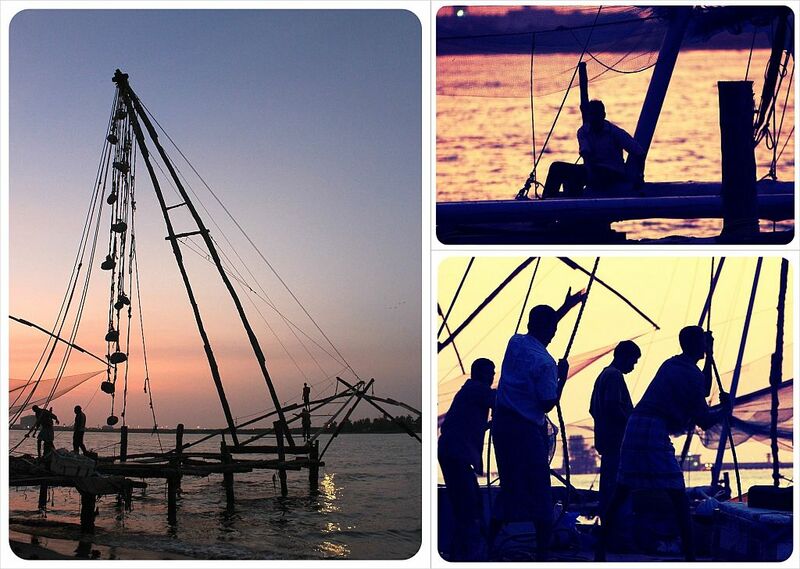 We also clung to the rope hoping our strength helped them bring in the nets! It’s a beautiful corner of India. Tough task! Interesting that I have heard of these but never read about them in such detail. 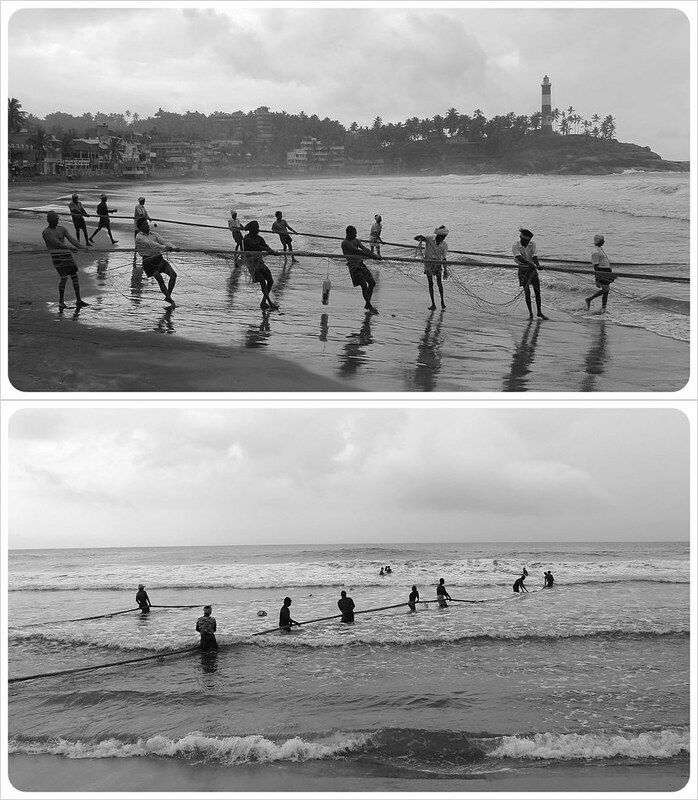 The photographs are quite amazing, narrates their whole day in pictures! Wonderful post. 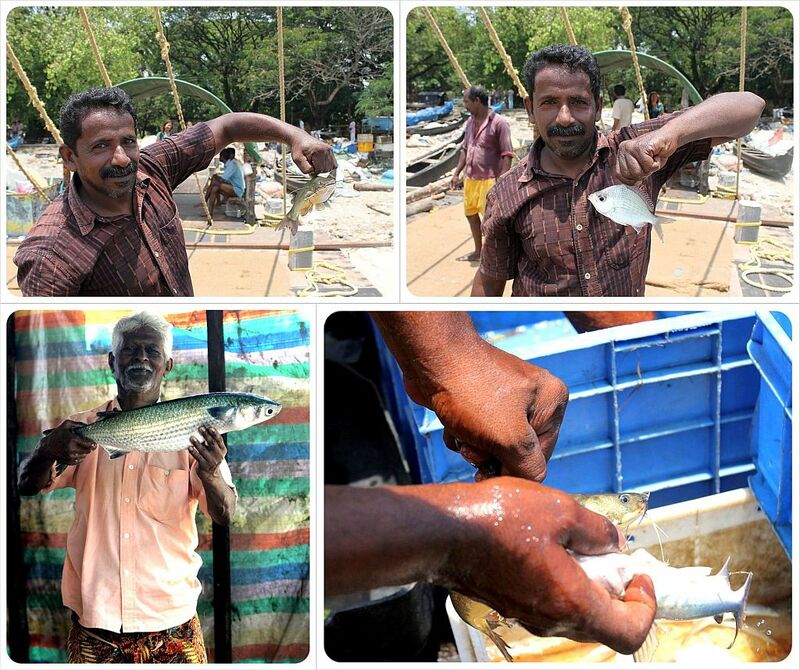 Indeed marvellous story about these fishermen of South India. 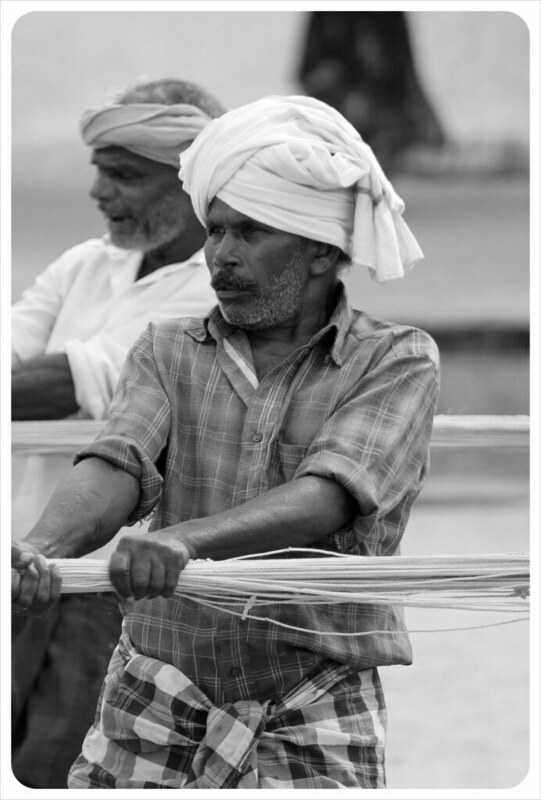 The fishermen in all parts of India face lots of hardships. Thanks Shalu. It was really eye-opening, especially the way we viewed it. First we watched all the hard work and our respect for them grew so much, and then to see this tiny result, we could only imagine the disappointment they feel after so much hard work! Definitely sounds like this was fascinating to watch! Crazy how little they actually pull out of the water though. What a strange way of fishing. I wonder why they do not find more effective methods or is it a case that over time they have depleted stocks? I think the stocks have definitely become depleted, like you say. This is something I noticed a few times in India, that there is this habit of putting so much manpower behind a process that yields a limited result. I don’t know if it’s because India is a collectivist culture where teamwork is most important (many cultures are like this) or if it is just because there is no other work in the area and so people cling to this even if returns are diminishing over time? I have always been fascinated by fisherman. Love this post from ya’ll — photos and the inner story of it all. Thanks.